Just launched in copper or silver are the 9062 (with glass) & 9063 dung beetle oil lamps which feature the industrious and often entertaining, African Dung Beetle. Could there be a more quirky or adorable addition to any table setting! 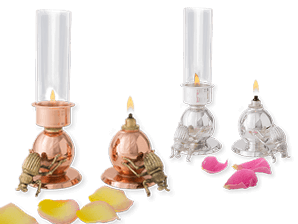 Each dung beetle oil lamp is fitted with a glass fibre wick which is factory adjusted for ideal flame height and will last the life of the lamp. Copper is the latest “hot” trend in interior design and what could be “hotter” than quality African copper products made in Africa! 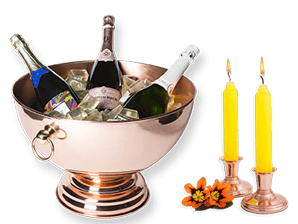 As all of our hollowware is manufactured from solid copper plate, we are able to offer a wide selection of contemporary and classic copper products – any item that you see on our website that is offered in silver plate can be supplied in copper. 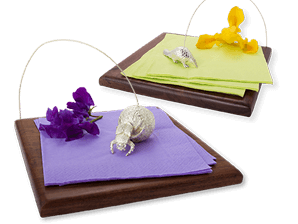 Just added to the very popular napkin holder range are the industrious African Dung Beetle, and two versions of the reclusive and severely endangered African Pangolin, feeding and curled. With a solid teak base and beautifully crafted motif, this range is a great way to keep those napkins under control! 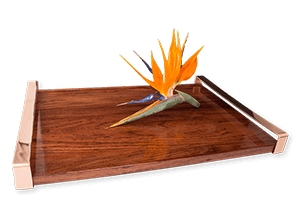 Just launched, this modern solid teak & copper tray combines the richness of solid African teak with the burnished splendour of African copper. This tray is available in two sizes – C1665 (large) & C1670 (medium). The AIM team would like to offer our sincere congratulations to the exclusive Angama Mara Lodge, Kenya, on their recent launch. 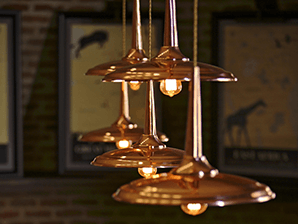 We were extremely privileged to be chosen to supply their copper lighting requirements and we worked closely with well-known décor stylist, Annemarie Meintjies and project manager, Lesley Fox to design and manufacture a range of pendant and wall lights to their requirements. Pictured above is the impressive copper ‘chandelier’ which hangs above their Refectory table. 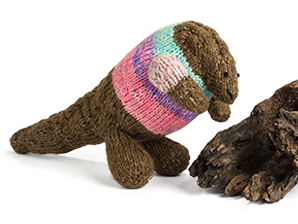 Recently Gogo Olive launched their new Shamwari (friend) which pays homage to the shy and extremely endangered African Pangolin. If you have ever had the privilege to interact with one of these delightful animals or if you have seen any videos of them, you would be totally entranced. We all need to do our part in stopping the horrendous poaching of these gentle animals.